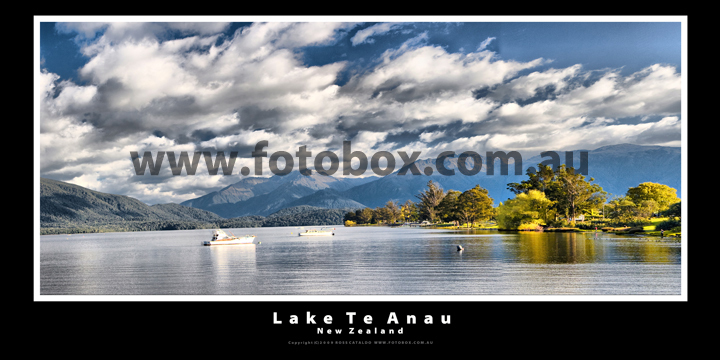 Image Information " Lake Te Anau is in the southwestern corner of the South Island of New Zealand. Its name was originally Te Ana-au, Maori for 'The cave of swirling water'. The lake covers an area of 344 km², making it the second-largest lake by surface area in New Zealand (after Lake Taupo) and the largest in the South Island. Lake Te Anau is however the largest lake in Australasia by fresh water volume. The main body of the lake runs north-south, and is 65 km in length. Three large fiords form arms to the lake on its western flank: North Fiord, Middle Fiord and South Fiord. Several small islands lie in the entrance to Middle Fiord, which forks partway along its length into northwest and southwest arms. The lake lies at an altitude of 210 m, and since its maximum depth is 417 m much of its bed lies below sea level. Several rivers feed the lake, of which the most important is the Eglinton River, which joins the lake from the east, opposite the entrance to North Fiord. The outflow is the Waiau River, which flows south for several kilometres into Lake Manapouri. The town of Te Anau lies at the south-eastern corner of the lake, close to the outflow. Most of the lake is within Fiordland National Park and the Te Wahipounamu World Heritage site. Other than the Te Anau township, the only human habitation close to the lake is the farming settlement of Te Anau Downs, close to the mouth of the Eglinton River. Between these two settlements the land is rolling hill country, but elsewhere the land is mountainous, especially along its western shore, where the Kepler and Murchison Mountains rise 1,400 m above the surface of the lake."